The Hamilton Beach 32100A food dehydrator features a total of five stackable trays that are made from a durable plastic. This model also comes with a solid sheet and a mesh sheet, which allows you to process a wider variety of foods such as fruit leather, granola or yogurt. This is an affordable model, which is why we were surprised to learn it’s packed with so many features designed to make the food dehydration process very hands-off and simple. You’ll love the forty-eight-hour timer that allows you to pop some trays in the machine and go about your day as the dehydrator sets into action. The adjustable thermostat allows you to adjust the drying temperature for more efficient use depending on the type of food you’re drying. This model incorporates a powerful fan that’s designed to push the hot air up through each tray. This works to speed up the drying time and ensures food is evenly dried. Unlike other models in this price range, this food dehydrator will give the user more control over the drying process. Set the temperature using the digital panel. Choose from a temp range of a 100 degrees to 160 degrees, in increments of five degrees. This allows you to actually fine-tune the temperature as much as you want. Lower priced models will only feature preset temperature options, so this feature is a big deal. During operation, we found the machine to be about as noisy as a box fan. It comes equipped with a clear lid that allows you to closely monitor the drying process when you’re trying out a new technique or food. The airflow is continuous, which means you won’t have to worry about rotating the trays. The dehydrator’s design features a bottom mounted motor which makes this model very stable when placed on a countertop, should you decide to leave it out. The included instructions are very detailed and easy to follow, offering information on food safety and important drying tips. The manufacturer recommends drying different types of foods separately. As an example, you should never try to dry fruit leather or granola in the same batch as beef jerky or yogurt, because these foods require vastly different drying temperatures. For consistency and flavor, fruit should be dried in their own batch and veggies in another. It’s very important to stack all the trays for proper airflow before you switch the dehydrator on, even if some of the trays are empty. The mesh liners for the garden herbs and fruit leathers should only be used in the two top trays. 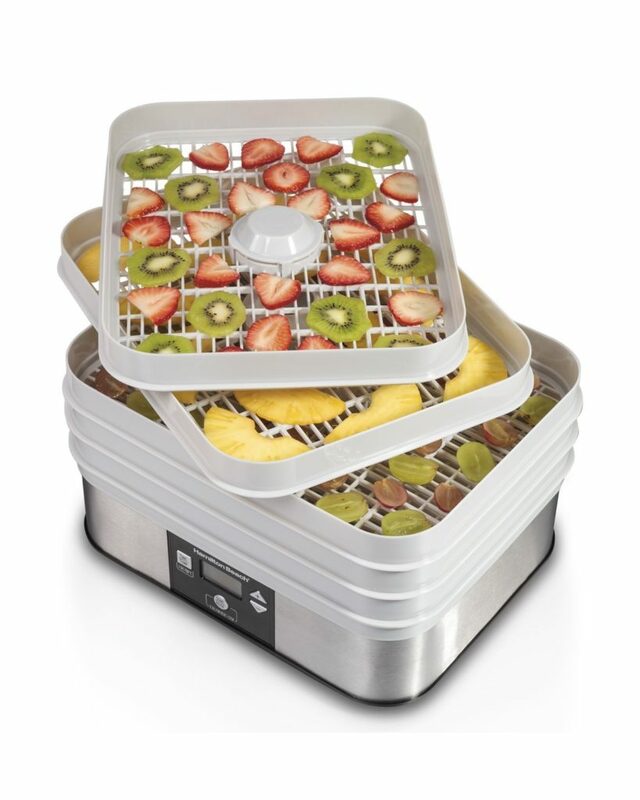 This dehydrator is extremely easy to clean thanks to the tough plastic lined trays that are designed for easy washing. It’s also important to note that this model is designed for home use only and is unable to handle high volume. Before you begin slicing up food, keep in mind that each of the trays has small holes that are designed to facilitate airflow. Avoid cutting the food too small or they can fall through the holes, which, in turn, can result in unevenly dried food. Poorly dried food can also be a breeding ground for bacteria. Pros: A food dehydrator may run for several hours, depending on what you’re drying. With the timer and the automatic shutoff feature, you can set the dry time without the worry of ruining a batch. The forty-eight hour run time is more than enough time to dry a large batch of food. Another big advantage this model offers are its sheets and trays. Since this model is priced to attract beginners, it’s great that it comes with such a wide variety. Aside from the standard trays, you’ll get the solid sheet and the fine-mesh sheet. You can use purees or jams to make your own fruit leathers, or you can dry herbs, seeds, or nuts, without anything falling through the holes in the tray. Adding the digital panel with the automatic shutoff feature may not seem like a big deal, but it really is. Most manufacturers won’t add these features to their lower priced models, but Hamilton Beach made this budget friendly option really shine with a wide range of convenient features that make using this machine a breeze. Cons: There have been some complaints regarding uneven heat distribution. This can be due to the vertical flow design. Most models with a vertical flow design will have some issues when it comes to heating. Because of this, we recommend checking on your batches once an hour the first few times you use it. Other buyers mentioned that the dehydrator’s fan can get loud from time to time, especially for longer dying times. If the noise is an issue for you, you should place this model in a secluded area, especially if you prefer drying a batch during the night. While the addition of the digital panel is great, some consumers reported that the dehydrator gives a lower temperature than the temperature that it’s set at. Most users can agree that the actual temperature is about five degrees less. With two different sheets and five trays, this dehydrator is very versatile. Additionally, the dehydrator is super easy to use, clean, and maintain. Consumers who purchased this model considers it as one of the best food dehydrators and gave it a rating of four and a half out of five stars for ease of use, extra sheets, digital temperature control panel, and overall quality.